Notes: PRR Class EF-15A; Altoona, PA. Description: Here is a photo of Pennsylvania Railroad engine #9819, an EF-15A built by GM-EMD in May of 1951, rated at 1,500 horsepower, and retired in November of 1966. The photographer's name is not recorded. Henry C. Westenberger Collection. Description: Sunday. 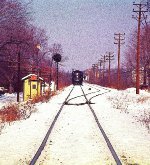 Here is an original photo that I took of a Pennsylvania Railroad train in Altoona, Pennsylvania, on 02 May 1965. Shown here (R to L) are PRR engines #7026, #9660, and #9819. All were built by EMD. #7026 is an EFS-17M built in 1955 and rated at 1,750 horsepower. 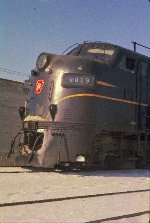 #9660 and #9819 are EF-15A's rated at 1,500 horsepower each; #9660 was built in 1950, but #9819 was built in 1951. They are pulling a 128-car westbound mixed-cargo freight train with N-8 caboose #478039, plus pusher engines #8613 and #8614. This train is "sandwiched" in-between two moving trains: an eastbound coal train on the right, and a 129-car westbound mixed-cargo freight train on the left. The 4th Street Bridge is also visible in the background. Description: Horseshoe Curve-1966. Here is an original photo that I took at the Pennsylvania Railroad's Horseshoe Curve near Altoona, Pennsylvania, during mid-May of 1966. Shown here is PRR engine #9819 and another unit whose number is not legible. Both locomotives were built by EMD. #9819 is an EF-15A built in 1951 and rated at 1,500 horsepower. They are pulling a smokin' eastbound coal train around the Horseshoe Curve and down the Allegheny Mountains to Altoona and points East.